This paper provides analysis and a set of concrete recommendations, both for the period of transition before the inauguration, and for the start of the next presidency, to encourage and sustain innovation in government. According to a 2015 survey by Pew Research Center, the public believes existing democratic institutions are failing. Just 20 percent say the federal government runs its programs well, and 59 percent say the government is in need of “very major reform”—up 22 points since 19971. With rates of trust in government at an all-time low, technology and innovation will be essential to achieve the next administration’s goals and to deliver services more effectively and effciently. The next administration must prioritize using technology to improve governing and must develop plans to do so in the transition. On January 28, 2016, The IBM Center for The Business of Government and The Partnership for Public Service hosted a discussion, The Ready to Govern Innovation Roundtable. Moderated by Professor Stephen Goldsmith, the event convened an exceptional group of 35 current and former senior offcials from both parties, leaders from Capitol Hill, as well as experts from academia and the private and nonprofit sectors for a wideranging discussion on how the federal government can use technology to achieve the next president’s policy priorities regarding economic growth, immigration, national security and responding to natural disasters. This paper provides analysis and a set of concrete recommendations, both for the period of transition before the inauguration, and for the start of the next presidency, to encourage and sustain innovation in government. Leveraging the insights from the experts who participated in a day-long discussion, we endeavor to explain how government can improve its use of using digital technologies to create more effective policies, solve problems faster and deliver services more effectively at the federal, state and local levels. Part I of this report presents observations and recommendations from a wide-ranging roundtable discussion on government innovation. The roundtable focused on: effciency and effectiveness; the customer experience; citizen engagement; and innovation through leadership and talent, process, scale and governance. Talent emerged as a key challenge – the difficulty of bringing people into government, and in harnessing the creative talent of civil servants currently serving. Participants agreed that the next administration would be well advised to focus on talent as a key enabler for driving innovation. 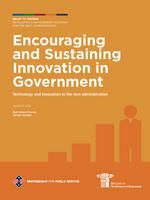 Part II takes stock of past experiences in the use of technology and innovation in government. The next administration will have the opportunity to build on progress from past administrations – from President George W. Bush’s e-government initiatives to the many efforts undertaken by the Obama administration. Despite significant obstacles, including obsolete infrastructure and a patchwork of policies, considerable progress has been made along three government-wide and agencyspecific dimensions. The final part offers a series of five broad recommendations and 10 specific and implementable actions to institutionalize a culture of innovation. By building on progress that has been made and effectively utilizing the tools and levers in the federal government, the next administration can institutionalize the use of technology to enhance government innovation and effectiveness. The transition teams can accelerate these efforts by thinking strategically about how to implement an innovation agenda within agencies and through government-wide initiatives. The transition team can also make innovation a priority in the selection of appointees and in providing a clear agenda for action. Read the article in Federal News Radio. Watch the Government Matters television segment from News Channel 8.